Waterbury Clock Co. tambour, a rare model, "Loirol", with a porcelain dial and a beveled glass below the dial that allows you to watch the pendulum. Full black label on the base, and a factory sticker, "9492". In that the movement is signed "Waterbury Clock Co.", plus, "Patented Sept 13, 1898", I must assume the clock was made after 1898. The movement is 8 day, rack and snail count, strikes a gong on half hours and hours. 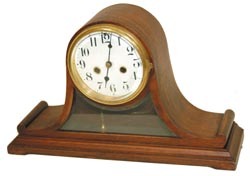 The nice mahogany case is only 16.5" wide and 10" high but it packs a big punch when you consider what has already been said, plus it has a heavy brass sash and thick beveled glass over the nice porcelain dial. Heavy back door with latch. This clock is far better than other Waterbury tambours, and it is not pictured in the catalogs.